Keep your porch lights (and even some interior lights) on for the duration of the night, even if you are going out of town. Vandals are less likely to target the home of residents who are at home. Alternatively, consider installing motion sensor lights that activate with any movement. These can be a great investment in the long run, as they allow you to fall asleep while decreasing your electric bill and knowing that your lights can still scare away vandals. Park your car in the garage instead of on your driveway. If your car is inside, vandals can’t access it. If you don’t have access to a garage, consider parking your vehicle behind your home instead of in front, or ask a neighbor if you can borrow their space for the night. Halloween pranksters often egg cars as they drive by. If you don’t plan on handing out candy to trick-or-treaters, then don’t answer the door if anyone comes knocking. Answering the door without any candy prepared will give pranksters and bitter trick-or-treaters the green light to retaliate. Keep your windows covered so criminals (or even curious peeping toms) can’t see inside your home. Don’t participate in any pranks. If you have children, be sure to let them know that pranks can be serious crimes, and they are not to discuss or take part in any pranks on others’ homes. You and your family shouldn’t give off the impression that you think pranking is funny. Don’t leave loose yard decorations or items lying around outside. If it isn’t secured, then it could possibly be broken or stolen. Also, don’t leave your pumpkins outside at night. A common Halloween prank is smashing pumpkins outside of people’s homes. If you keep small possessions and jack-o-lanterns out of sight, then pranksters won’t think to target your home. If you think you may become a target for vandalism, set your sprinklers on a timer to go off at random during the night, or stay alert and turn them on when you hear someone lurking near your home. Vandals wouldn’t bother targeting a house that has their sprinklers going off. 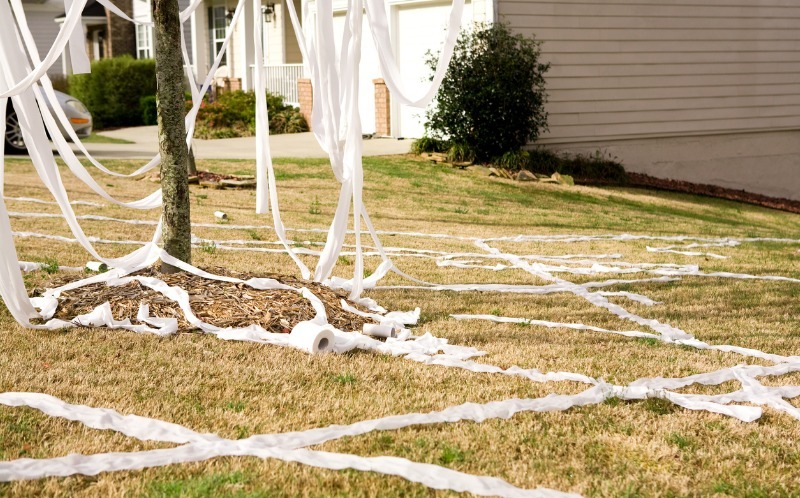 Who would risk getting soaking wet while TP-ing or egging a home? If you do want to hand out candy, set up a station in your driveway or on the street/sidewalk outside your home. This will prevent others from walking too close to your home and will allow you to keep an eye out while still having fun and participating in the festivities. Halloween should be fun, but not too scary. You can still enjoy the holiday without feeling afraid that your home will be at risk of vandalism. Utilize these tips and tricks so your night will be full of treats.